I want to know all the shortcut keys which are introduced newly in Windows 8 Operating System? So that I can use it from the beginning and get use to it. Function Keys stopped working on Windows 7 System. Re: Can you list down the shortcut keys which are specially introduced in Windows 8 Operating System? Windows Key + T – Dumps you back to Desktop Mode and cycles through your open windows on the taskbar. Windows Key + Q – Opens up Windows 8’s global search utility within Metro. Windows Key + Shift + . – Docks the app to the left, middle, or right side of the screen with each press. Windows Key + M – Minimize all applications and goes to the desktop. One good enhancement as done in the previous most used shortcut key that is printscreen key where when it is pressed along with Windows key it takes the print of the screen and automatically saves it to the Pictures folder, so there is no need anymore of pasting it into the MS Paint and then saving it as the picture. Windows Key + D --> To go to the Desktop. Windows + H --> Share. Windows + K --> Devices. Ctrl + + --> Zoom in. Ctrl + - -->Zoom Out. For more Shortcuts Click HERE. Window key+F = finding files and folder. Window key + I = open setting menu. Windows Key + T- Empty you on returning to mode for bureau and cycles for your open windows in the taskbars. Windows Key + Q- Do accessible Windows 8 the utility of global search in the meter. Windows Key + Change + . - Docks the |app| towards the left, it centers, or make straight the side of the screen with each press. Windows Key + M- Minimize all applications and goes to the bureau. A good embossment as it makes in the previous the majority of the uses the shortcut type that it is the |printscreen| types where when it is in needs jointly with Windows type it take the printing of the screen and in an automatic way save it to the folder of cinemas, so exist any need never more than matching it in the painting of MS and then by saving it as the painting. you can use all the old shortcut keys in windows 8 which you've used in the earlier version of windows. there are some new shortcut keys are introduced in windows 8.
you can use all the old shortcuts in your windows 8 which you've used in the earlier version of windows. but Microsoft introduced some new shortcut keys in windows 8. Tap Windows Screen- Metro Start Screen. WK+C- Display Charms & Time/Date/Notification overlay. WK+F- Display File Search Pane. WK+L- Lock PC & Return to Lock Screen. WK+W- Display Settings Search Pane. In such maner using short cut keys available in Your comfortable for freely using for fast access and time Consumance and modality purpose..
-->Shift+windows Log+M--Minimize all applications and goes to the desktop. searching Engine is correctly way of process to become a Easy way to Known to such as keys.. Thank You..it is use full for You. Dear short cut keys play a great role in operating a computer system because dear it can save your time and all tasks performed only from keyboard. ** WINDOW KEY + E :- WINDOW EXPLORER. ** ALT +TAB :- TO SEE OPENED APPLICATIONS. ** WINDOW KEY +TAB :- TO SEE OPEN ITEMS ON DESKTOP. ** WINDOW +R :- RUN WINDOW. ** CTRL +F :- FIND. ** ALT_F4 :- TO SHUT DOWN SYSTEM. ** CTRL+Z :- UNDO LAST CHANGES MADE. ** CTRL+Y :- REDO LAST TASK. ** WINDOW KEY +F1 KEY :- HELP. ** CTRL + P:- PRINT COMMAND. ** CTRL + - :- FOR ZOOM OUT. ** CTRL ++ :- FOR ZOOM IN. ** CTRL +T :- NEW TAB. searching Engine is correctly way of process to become a Easy way to Known to such as keys..as to try it and answer them. 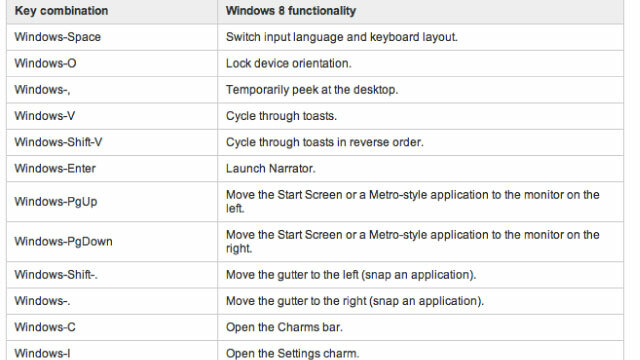 You can get the list of Keyboard Shortcuts that are especially introduced for Windows 8 without any much effort. Just open Help from the Settings option. Then, type "Mouse and keyboard: What's new" in the Search option and press Search button. You will see Keyboard Shortcuts in the displayed Article. 11:Windows + B for "SHOW HIDDEN ICONS"
windows key+B	Set the focus to the tray notification area. I hope the above information is useful for you to sole your problem. 1.Windows key + D= Desktop. 2.windows Key+C= opens the charms. 3.Windows Key+T = Dumps you back to Desktop Mode and cycles through your open windows on the taskbar. 4.Windows key+k=Device window will open. These are some short cuts there are so many other short cuts available in windows 8 you can find all these things in the Windows help go throght that once.